Tropical Depression 2 strengthened into a compact hurricane on July 6 as NASA's Aqua satellite gathered temperature data on the storm. At 2:30 p.m. EDT on July 5, the depression strengthened into Tropical Storm Beryl. At 5 a.m. EDT on Friday, July 6, Beryl became the first hurricane of the 2018 Atlantic hurricane season. 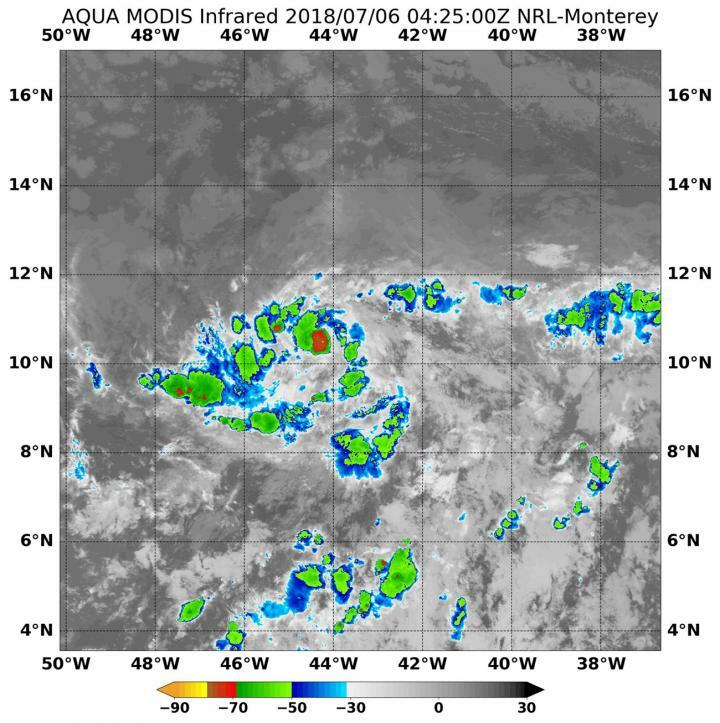 When NASA's Aqua satellite passed over the newly strengthened Hurricane Beryl on July 6 at 12:25 a.m. EDT (0425 UTC), the MODIS instrument or Moderate Resolution Imaging Spectroradiometer, analyzed the storm in infrared light. The infrared light provided temperature data that revealed how cold cloud tops were in the storm. The higher the cloud top, the colder, and the stronger the uplift in the storm. MODIS found coldest cloud top temperatures near minus 70 degrees Fahrenheit (minus 56.6 degrees Celsius) around the center, and as cold as minus 50 degrees Fahrenheit (minus 45.5 degrees Celsius) in fragmented bands of thunderstorms wrapping into the center. The National Hurricane Center (NHC) noted at 11 a.m. EDT (1500 UTC), the eye of Hurricane Beryl was located near latitude 10.7 degrees north and longitude 46.5 degrees west. Beryl was moving toward the west near 15 mph (24 kph). A faster westward to west-northwestward motion is expected to begin over the weekend and continue through early next week. On the forecast track, the center of Beryl will approach the Lesser Antilles over the weekend and cross the island chain late Sunday, July 8 or Monday, July 9. The estimated minimum central pressure is 994 millibars. Maximum sustained winds have increased to near 80 mph (130 kph) with higher gusts. NHC cautioned that interests in the Lesser Antilles should monitor the progress of Beryl, as hurricane watches could be needed for some of the islands by tonight, July 6. NHC said, "Additional strengthening is forecast during the next couple of days, and Beryl is expected to still be a hurricane when it reaches the Lesser Antilles late Sunday or Monday. Weakening is expected once Beryl reaches the eastern Caribbean Sea on Monday, but the system may not degenerate into an open trough until it reaches the vicinity of Hispaniola and the central Caribbean Sea."